question_answer1) Which of the following objects is not square in shape? question_answer2) Find the odd one out. question_answer3) Which of the following shapes has no corner? question_answer4) How many square sides a dice has? question_answer6) Which of the following shape has less than four corners? question_answer7) How many triangles are present in the given image? question_answer8) Which of the following is drawn using curved line? question_answer9) Which of the following things is not round? question_answer10) Which of the following is not a triangle? question_answer11) Which of the following can't be drawn with the help of a bangle? question_answer12) Which of the following can slide? question_answer13) Identify the given shape. question_answer14) Ball : Roll : Match Box : _________. question_answer15) Choose odd one out. question_answer16) Which of the following is a solid shape? question_answer17) Which of the following letter can be written with the help of both curved line and straight line? question_answer18) Which of the following statements is incorrect? question_answer19) Look at the picture and answer the question that follow. This picture is made up of 5 circles and 5 _____. question_answer20) Which of the following is made of straight lines? question_answer21) Count the number of squares and circles shown in the given figure. question_answer24) Directions (Q. 24): Read the given poem and answer the question that follows. I have a shape of bangle I go round and round, No start and no end, I can roll on a line, I can roll on a bend Look all around I'm not straight and I don't bend On the ground, in the air, you will find round things every where Which of the following statement is not true? question_answer26) A picture of a house is given. Determine how many types of shapes are used to make this house? question_answer27) Consider the two statements and choose the correct answer. Statement 1: A ball has a curved face that is why a ball rolls. Statement 2: A dice has a flat face that is why a dice slides. question_answer28) Match the column (I) with column (II). question_answer29) Objects like a book, a box, and a plate slide because they have _____ surfaces. question_answer30) Given below are few shapes, observe the shapes, and answer the following question. Which of the following is/are solid shapes? question_answer31) Which of the following can be drawn with curved lines only? question_answer32) Which of the following will change the shape of the rectangle? question_answer33) Read the following sentences and choose which one is true and which one is false. Shapes of the objects affect their movements like rolling and sliding. Circle is the only solid figure with no corners. Egg is an example of oval shape. question_answer34) How many equal parts are there in the rectangle ABCD? question_answer36) A pizza slice looks like. question_answer37) Consider the following statements and choose the correct answer. Statement 1: Cube, cuboid, sphere and cone are the examples of flat figures. Statement 2: Square, rectangle, triangle, circle and oval are the examples of solid figures. question_answer38) Match list (I) with (II). question_answer39) Count the total number of shapes used in the figure. question_answer40) Observe the given figure and identify the shape of the shaded area. question_answer41) Which of the following is cylindrical in shape? question_answer43) How many squares are there in this figure? question_answer44) Teena and Sheena both are fighting as Teena is saying ice is square and Sheena is saying ice is a cube. As a best friend of both, how will you manage the situation? question_answer45) Which of the following has four sides and four corners? question_answer46) If you are given a piece of paper and scissor which of the following shapes you can make? 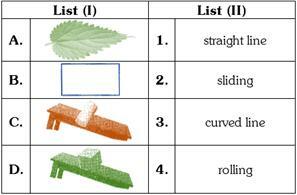 question_answer47) Which of the following object can roll on a slide? question_answer48) Which of the following will give a shape of a cylinder? question_answer49) Which of the following is a flat shape? question_answer50) Look at the given picture. Which of the following shapes are used to build the rocked in the given picture?